I have featured this Malay Tomyam stall, name Su Ail Kenari before. 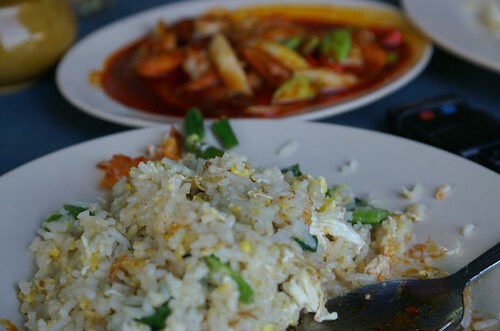 It is opposite the Penang Sheraton Hotel along Jalan Larut, after KFC. A small, shed but business is good all the time. I went there for dinner last night with my children. 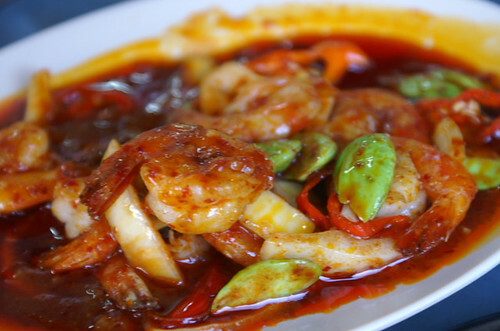 As I am eating alone, sort of, I ordered one little plate of sambal petai udang. My hubby hates those so since he wasn’t around, it is a chance for me to binge on petai alone. It looks rather oily but I just picked the petai and prawns so the oil doesn’t bother me. My favourite item on their menu is the nasi goreng ikan masin. It is salted fish fried rice with the most delicious fragrance and best taste. If you are there, make sure you wallop their sambal belacan. They place these tiny pots on every table for you to enjoy. Very, very oomph. Check it out if you haven’t been there before. They have this fried black promphet with black sauce (i think so). Very good also. I like their sambal. The belacan they used is different from our usual one. Yummy. We can get frozen petai here in Perth but so far I never buy it yet. Ooooohhh, I love petai very very much! Only hindrance is the after effect. Any advice on how to get rid of it? I’ve been warned to get out of the house each time I consume petai ……so pitiful ya? Should try another fried petai with sambal in Kepala Batas (a small shop next to a big hardware shop). It’s so good that whoever ate there would love to visit them again. It only opens during lunch time. 🙁 too bad.